Australia reversed a three-year enrolment decline in 2013, registering a modest increase of 2.6% in total international student numbers and a much more noticeable bounce (9.3%) in student commencements. We reported previously on early Australian Education International (AEI) data for 2014 that indicated that this growth was continuing in the first half of the year. And now the latest data, reaching up to year-to-date (YTD) November 2014 and so covering nearly the entire year, clearly establishes that the turnaround that began in 2013 has strengthened and extended through 2014. As of YTD November 2014, there were 583,714 full-fee paying international students enrolled in Australia. This represents a 12.3% increase over the same period for 2013, and compares very well with the average annual enrolment growth rate of 5.4% per year over the previous ten years. Higher education accounted for the largest volume of enrolment and commencements, 42.8% and 31.3% of the YTD November 2014 totals respectively. International higher education enrolment in Australia grew by 8.6% compared to 2013, and higher education commencements were up 14.7%. ELICOS also showed especially strong growth. YTD November 2014 enrolment was up 19.7% over the same period for 2013 and commencements grew by 17.4% year-over-year. All other sectors – VET, schools, and non-award programmes – also registered strong growth YTD November 2014. Please see the following table for additional details. While there are many important trend lines in the latest AEI data, the notable increases in both ELICOS enrolment and commencements certainly caught our attention. English Australia reports a particularly heavy spike in ESL enrolment over the 12-month period spanning the second half of 2013 and first half of 2014 with “more sustainable levels of growth” in the latter half of last year. The table below offers additional details. The ELICOS sector is the first study pathway point for two in every five international students in Australia’s tertiary sector. Almost two-thirds (63%) of international students who completed an ELICOS course in 2012 progressed to further study in another sector. Of the 63% who did progress, one-third (33%) moved directly into higher education, 21% moved straight to VET, and 9% went either to non-award programmes or schools. Chinese and Vietnamese students are the most likely to stay in Australia for further study once they’ve completed an ELICOS course. 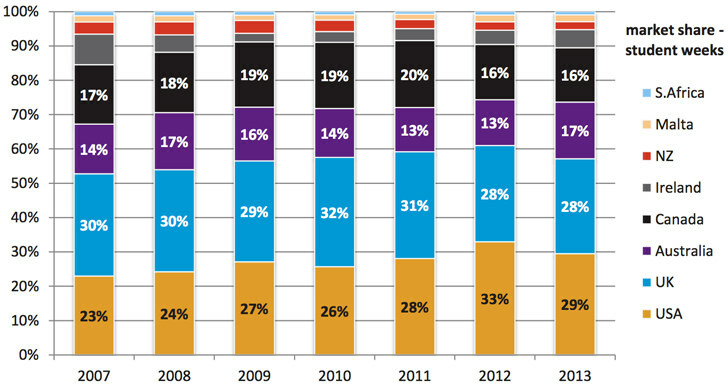 Nearly three-quarters (72%) of Chinese ELICOS students went on to higher education in 2012, and over half of Vietnamese did (56%). 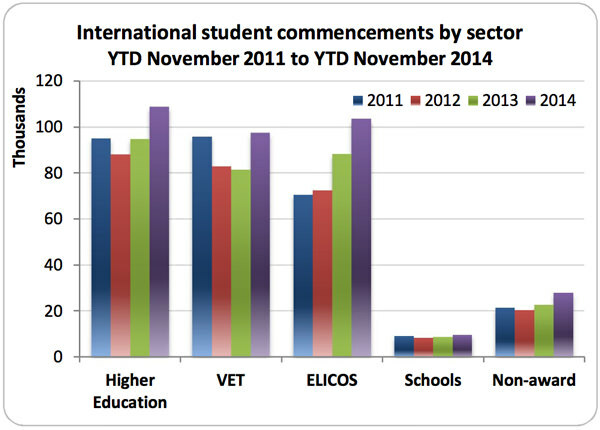 Indonesian and Thai students are the most likely to move from ELICOS to the VET sector. More than half (53%) of Indonesian students went on to VET from ELICOS courses, while 42% of Thai students did. As the following chart illustrates, ELICOS commencements have now recorded two consecutive years of substantial growth – a trend that bodes well for continued strengthening of enrolment in other education sectors in 2015 and after. With its strong enrolment growth through 2013 and 2014, it is not surprising that Australia’s ELICOS sector has improved its international position over this period as well. A separate analysis from English Australia points to the increased competitiveness of Australia’s ELICOS sector through 2013. The peak ELICOS body points out that Australia overtook Canada that year to occupy third place (after the US and UK) in terms of market share by student-weeks delivered. It appears that both Australia and Ireland gained market share over 2013, largely at the expense of the US. China and India are Australia’s two leading source countries, accounting for 26.2% and 10.7% of total enrolment respectively, and both registered notable gains in 2014. Chinese enrolments increased by 8.5% YTD November 2014 and Indian students numbers jumped up by 29.3%, a marked contrast to the declining trend for India reported in the UK in recent years. Vietnam, South Korea, and Thailand round out the top five source countries for Australia and all recorded single-digit growth in 2014 compared to the year previous. Outside of those top sources, however, several countries in the top 15 registered strong, double-digit gains for YTD November 2014 (on a base of 8,000 students or more). These include Brazil (+26.8%), Nepal (+27.2%), Pakistan (+15.9%), Hong Kong (+22%), and the Philippines (+21.1%). This entry was posted in Australia, Australia/Oceania, Higher Education, Language Learning, Most Popular, Regions, Vocational and tagged study abroad, student pathways, Indonesia, vocational schools abroad, universities with international students.